1Jack up the car and remove a wheel. Use jack stands for safety! 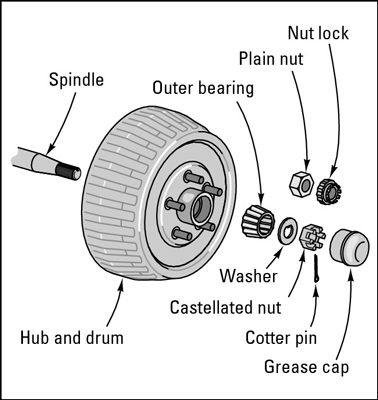 2If you have a hubbed drum, pry the grease cap off the end of the hub, remove the cotter pin, and slide the castellated nut or nut-lock-and-nut combination off the spindle. Skip this step if you have a floating drum. 3Slide the outer bearing, with the washer in front of it, off the spindle. As you can see here, the bearings are usually tapered roller bearings, not ball bearings. 4Check the grease in the spaces between the bearings. Don’t wipe off the grease! If the grease has sparkly silver particles in it, or if the rollers are pitted or chipped, you must replace the bearings. If the outer bearings are damaged, the inner bearings probably are, too. 5Clean the outer bearings thoroughly in solvent or kerosene with an old paintbrush. Don’t smoke when cleaning the bearings! Get rid of all the old grease to inspect the bearings properly. Also, when you repack the bearings with fresh grease, you don’t want any old grease spoiling the new stuff. 6When the bearings are shiny and clean, rinse them off with water and dry them, or use brake cleaner to remove the solvent. If you pack new grease over the solvent, the grease will dissolve and you’ll ruin your bearings. 7When the bearings are clean and dry, look at the rollers for signs of wear. If the rollers are gouged or bluish in color, or if you can almost slip the rollers out of their place, replace the bearing and its race, which is pressed into the hub. 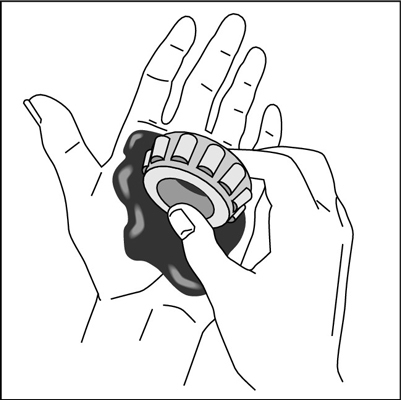 8Take a gob of wheel-bearing grease and place it in the palm of your left hand. You may want to invest in some thin, disposable plastic gloves for this job. 9Press the bearing into the gob of grease with the heel of your other hand as shown here. This forces the grease into the bearing and out the other end. Make sure that you work the grease into every gap in the bearing. You want it to be nice and yucky. Then put your bearing down on your clean rag. 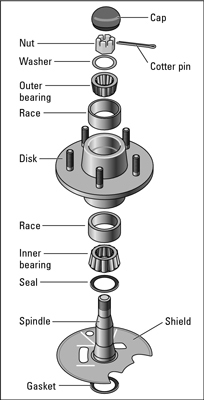 Your inner wheel bearings lay in the center hole of the drum or disc. At this time, you have to decide whether you’re going to remove the inner bearings to check and pack them. Generally speaking, if the outer bearings look okay, the inner ones are okay, too. If you’re not planning to repack the inner bearings, don’t attempt to take them out of their seat in the drum. 10If you are repacking the inner bearings, slide the brake drum toward you, with the inner bearings still in place. Don’t slide the drum completely off the spindle. Instead, screw the adjusting nut back in again, pull the drum toward you, and push it back. 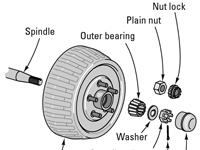 The adjusting nut should catch the inner bearing and its grease seal and free them from inside the hub. 11Clean and pack the inner bearings. 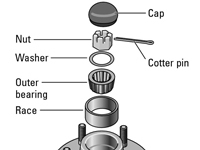 Use the technique described for cleaning and packing your outer bearings. Wipe out the hole in the hub of the drum where the inner bearing was; then take a gob of grease and smooth it into the hole. Be sure that the grease fills the races inside the hub where the bearing fits. Wipe off excess grease around the outside of the hole so that it doesn’t fly around when the car’s in motion, possibly damaging your brakes. 12Insert the inner bearing into the hub with the small end first and spread a film of grease around the sealing end (the flat, smooth side). To fit the new grease seal into place properly, slide it in evenly; otherwise, it will bend or break and you’ll lose your grease. Find a hollow pipe or a large socket from a socket wrench set that has roughly the same diameter as the seal. With the flat, smooth side of the seal toward you, place the seal in the hub opening, and use the pipe or socket to move it into the hub gently and evenly. The new seal should end up flush with the outside of the hub or slightly inside it. 13Carefully reassemble everything in reverse order. Use the diagram in Step 3 to help you get everything back on correctly.